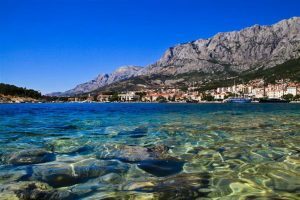 Makarska is one of the most famous tourist locations along the Croatian coast and is also one of the most beautiful, with a number of pebble beaches, pine trees, crystal clear sea and peaceful bays. 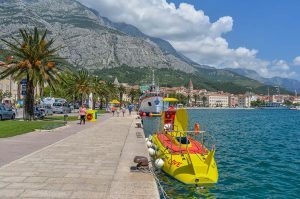 Makarska offers to its visitors loads of things to do. 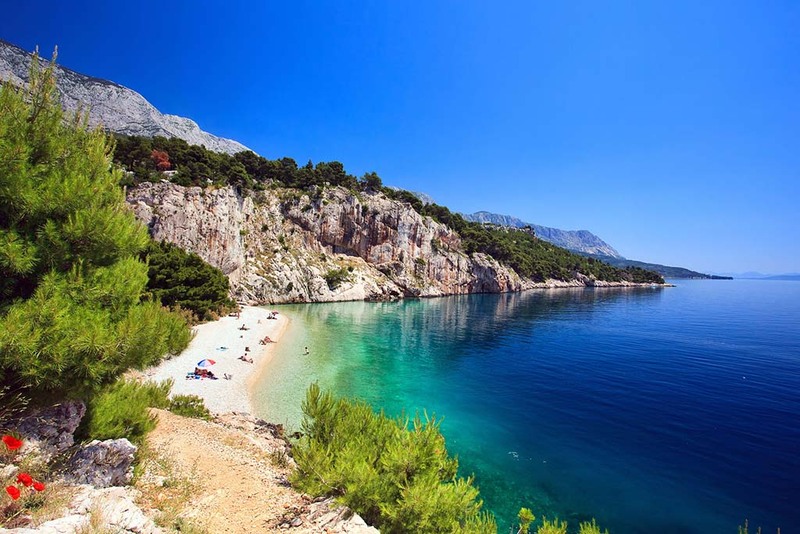 Stroll along Makarska harbour, visit museums and galleries, hike on Biokovo or just chill out on the beach. Biokovo is the largest and highest mountain in Dalmatia. 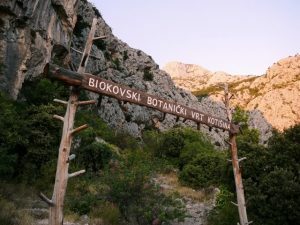 It rises vertically from the Adriatic Coast to height of 1762 m. Because of it’s geographical position, Biokovo is a mountain that has continental as well as Mediterranean climate, so various plant species of both worlds meet and live next to each other. Spectacular view from the mountain will take your breath away – on the clear day one can see all Dalmatian islands as well as large part of Dalmatian coast to the south, and to the north, towns of Vrgorac and Imotski and their surrounding villages. The weather conditions can change in a moment, no surface water is to be found and any deviation from the marked trail entails some risk. Hiking boots, backpack, spare clothing, raincoat, drinking water and a good map of the Park are the items you will need. 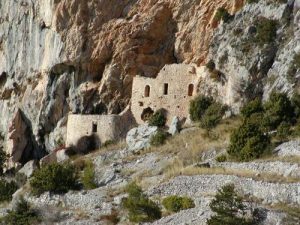 Biokovo is the mountain that one can visit either by car or bicycle as well as on foot from various parts of Adriatic coast and Makarska Riviera. The Biokovo Botanical Garden Kotišina has been established in 1984 above the village of Kotišina, a horticultural monument (16.5 hectares) aimed at nature conservation and protection of the Biokovo plant life. This is not a botanical garden in the classic sense, where each plant is brought by certain rules, but is designed as a “walled part of nature”, which will retain the natural vegetation forms with its native flora. 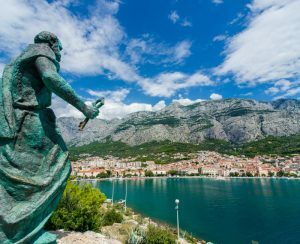 The central town square in Makarska is the location of the monument to Father Andrija Kačić Miošić, a Franciscan and Croatian folk poet, bulit in 1890, created by sculptor Ivan Rendić. The modern visage of the square was completed in the beginning of the 18th century with the completion of St. Mark’s cathedral. On the Kačić Square, between the monument and the church there is a Venetian fountain from the 1775. Along the cathedral, there is a Mediterranean-style town market, known for year-round activity. 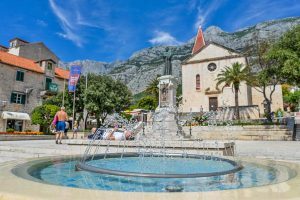 Viewed from a distance, the terracotta-tipped belfry of St Mark’s Church marks Makarska’s central square, the heart of the town. 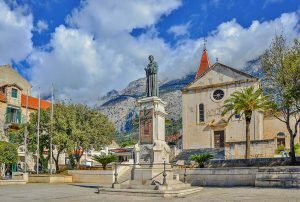 It is sometimes referred to as Makarska’s cathedral, since right up to 1828 Makarska had its own bishop who had his seat here. Its interior is certainly impressive. Construction of the church started in 1700 and it was consecrated in 1756 although never completely finished. 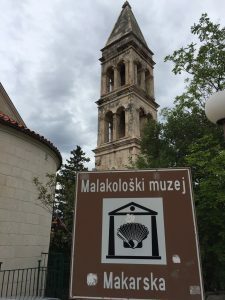 The Malacological Museum in Makarska was created by Father Jure Radić in 1963. It is located in the old section of the Franciscan convent under protection as a cultural monument. 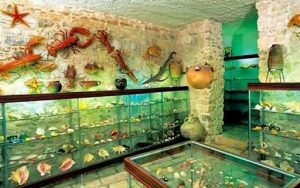 The museum has a permanent exhibition of sea snails and shellfish from the Adriatic, as well as from the rest of the world. Created with painstaking attention to scientific detail and a devotion to celebrating the hidden beauty in the world around us (including under the sea), Father Jure Radić created a collection that is the best of its kind in the country. Vepric is located in a harmonious natural setting, at the foot of the wooded hill. This place of pilgrimage was founded in 1908 by Bishop Dr. Juraj Carić who was also buried here. 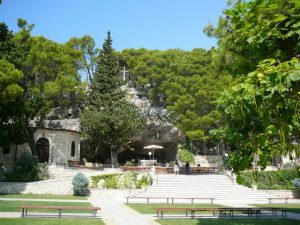 The natural cave and the surroundings, hills, plants and the spring easily remind one of the French Lourdes. A chapel and the sacristy have been built in Vepric, as well as the altar, confession booths, stations of the Cross, area for spiritual exercises, and paths for processions. Because of its natural beauty and peace, this location is regularly visited throughout the year. 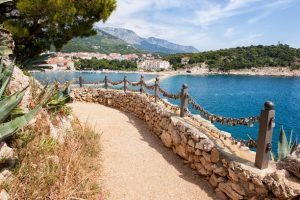 St.Peter is a small peninsula with long promenade and beautiful beaches. Views to the island, city of Makarska and the mountain from the peninsula St. Peter, are phenomenal. On the top you can find small church from the 13th century, and near the beach is the lighthouse built in the 19th century. Here you can enjoy the nature, go for a swim or enjoy beautiful views. You will find popular love padlocks, a place where you can start, renew or simply “lock” your love. Love locks are just below the statue of St.Peter who is holding keys in his hand. 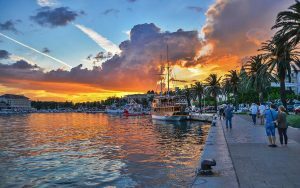 Along the harbour, overlooked by a string of cafés and pizzeria, wooden excursion boats offer one-day trips to Jelsa on Hvar and Zlatni Rat beach in Bol on Brac. 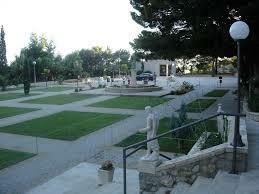 But the main attraction here would be the beaches, backed by pinewoods overlooking the crystal clear Adriatic Sea. You can just relax or have fun renting paddle-boats, banana rides and jet skis… After exploring Makarska you can have a good meal in our restaurant or just relax in our cozy rooms. Hei, I really appreciate this article.Really thank you! Fantastic. You have mentioned very interesting details! ps very good web site! One of the reasons why we decided to choose this hotel for our vacation. So helpful, concise and professional. Reading all your reviews and helpful posts like this, we are sure we will enjoy our stay with you very soon. 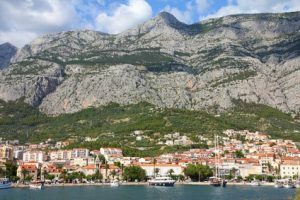 very informative article, we stayed in Makarska for 5 days and printed out this article to help us organise our stay, thank you! This is why we chose your hotel for our stay, very helpful and informative. We are sure we will love it! !